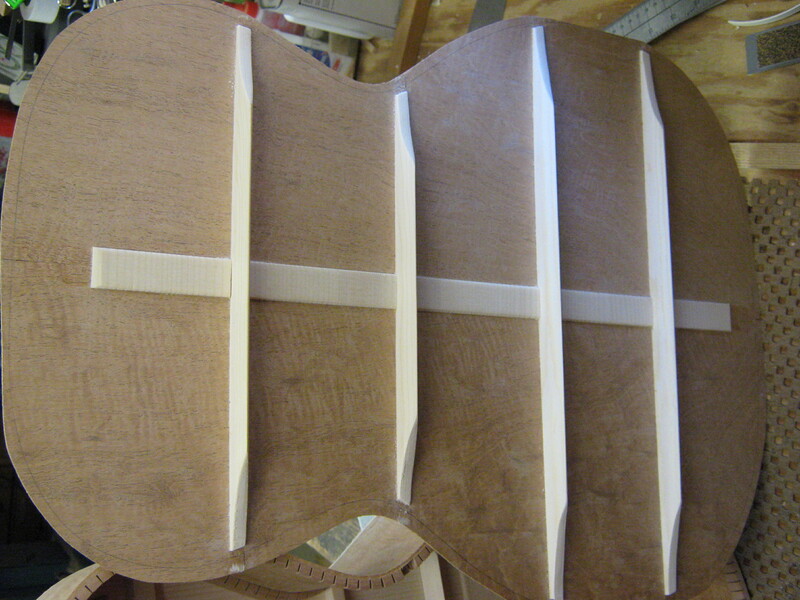 The four back braces are now shaped to their finished dimensions. They aren’t as wide or tall as the top braces because they don’t face nearly as much stress as the soundboard, but like the top braces, the back braces all have a pyramidal cross-section. I usually shape back braces more like a gambrel roof (think of a barn) on my steel string guitars, but I am trying to stay as close to the Stella design as I can, and this is how Stella did it. The rectangular braces are trimmed to the desired height and carefully shaped with a plane. The ends of the braces are pared down with a chisel, just like the top braces. As I remove wood from the ends of the braces I can hear differences in how the back vibrates when I tap on it in different spots. 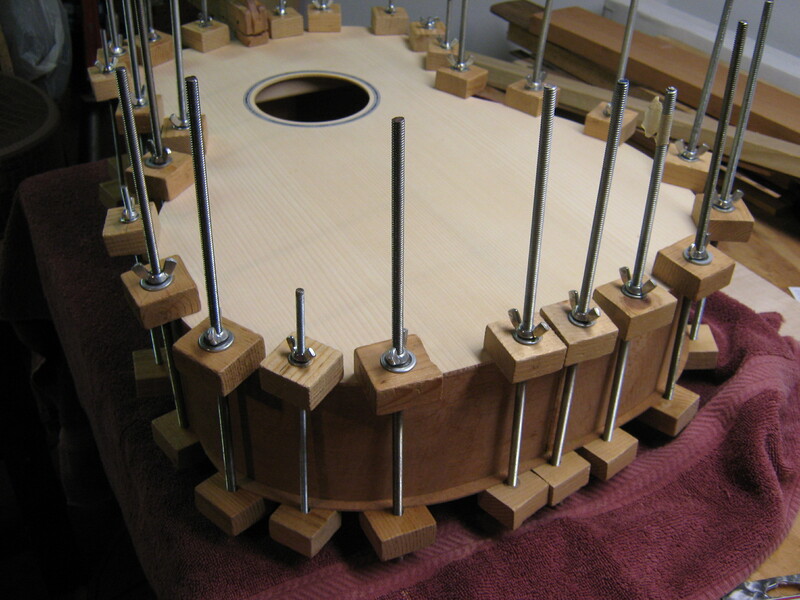 This is a very difficult thing to describe, but please understand that the vibration does change and even though I am using the same brace design as Stella, I still can control the responsiveness of the back–and the top–by the amount of wood I remove from the ends of the braces. Next comes a tricky operation. When I was preparing to glue to soundboard to the sides, I cut away all of the kerfed lining where the top braces intersected. After the top was glued, I went back and replaced the missing pieces of lining with spruce feet. 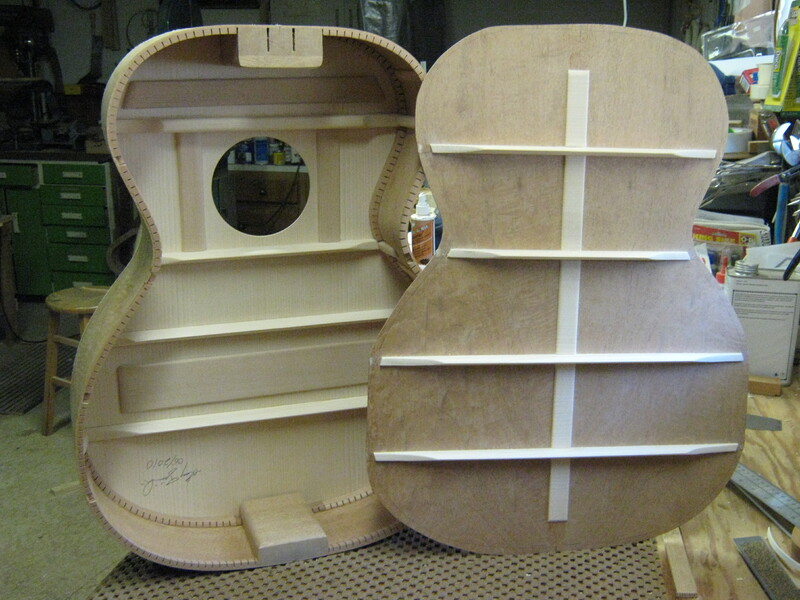 I could do that because the back wasn’t on the guitar, so it was easy to work on the inside. This time I won’t have that luxury, so rather than remove entire sections of the lining, I will just notch it out where the braces fall. 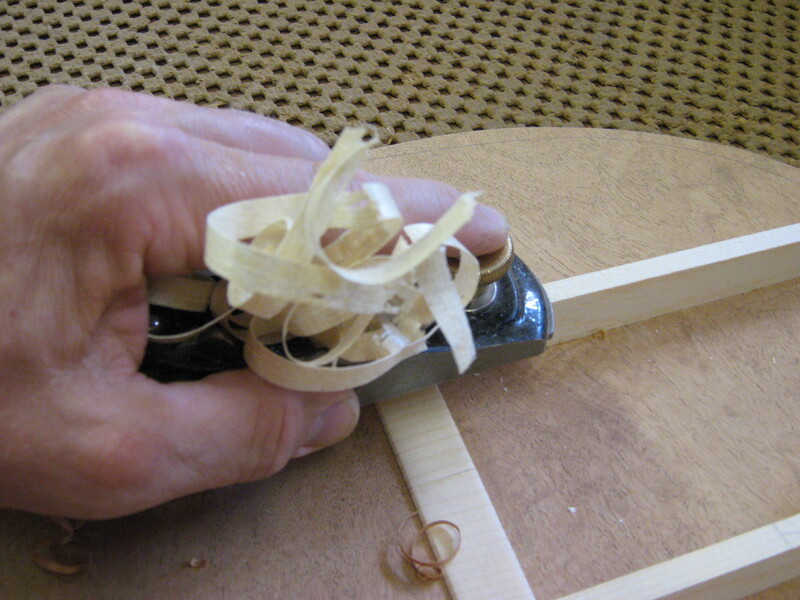 This is done very carefully with a chisel. I have to proceed cautiously for two reasons: first, if I try to be agressive, the lining wood seems to give way suddenly and I end up with the pointy end of the chisel in my finger, which is supporting the outside of the guitar opposite the chisel; second, I need to proceed slowly because I want to remove just enough wood for the end of the brace to fit into the notch. 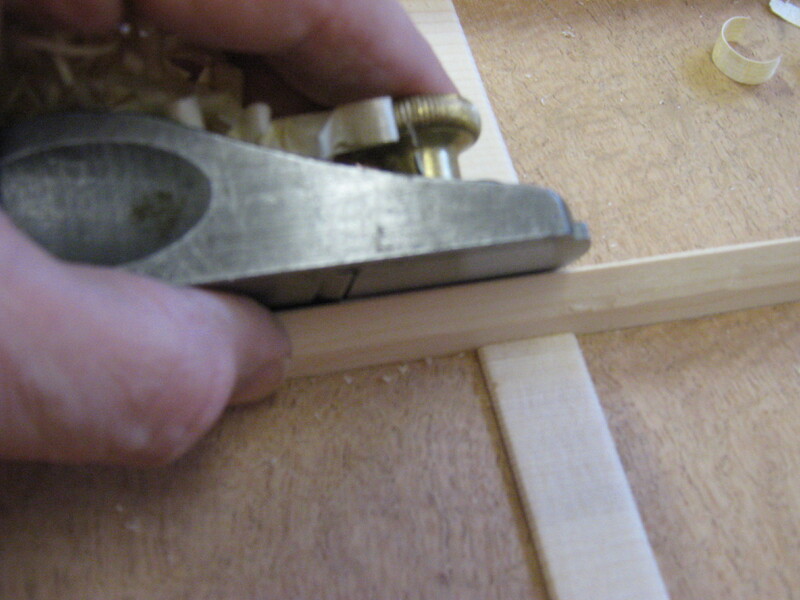 That way the remaining wood can support the end of the brace and reduce the chance of a brace ever popping loose. 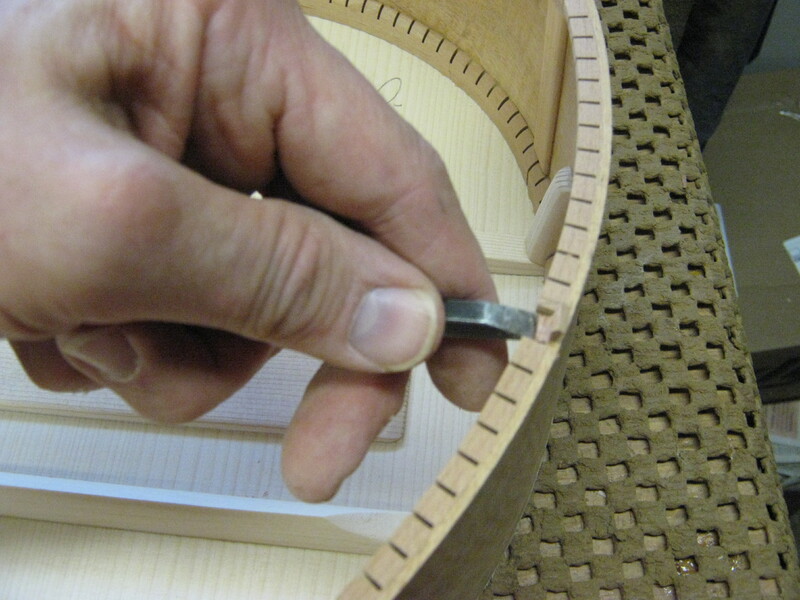 Below is a photo of the lining being notched with a chisel. My right hand, which would normally be on the outside of the body directly across from the chisel, is not in the picture because I needed to use it to operate the camera. Now the back is glued to the sides to complete the assembly of the body.